It is the first Sunday of Advent, and I am not ready. Despite best efforts to prepare, this day catches me off guard every year, cycling as we do through these seasons. Be ready, Jesus tells us today in the Gospel according to Saint Mark. (Mark 13:33-37) Be watchful—the master is coming at any moment and not even the wisest among us knows when that will be. To be Christian is to live in the not-yet, the already, and the will-be-again. We wait for Christ to be born to us and in us this Christmas. We know He has already come and died for our salvation. We wait for the in-breaking of the Spirit and God’s Kingdom to return. My soul is in flux this time of year. Outside of my window, the last vestiges of earth’s fertility and vivacity are fading away with the rapidly decreasing daylight. The final leaves let go and fall to Earth, dying so that something else may be born. 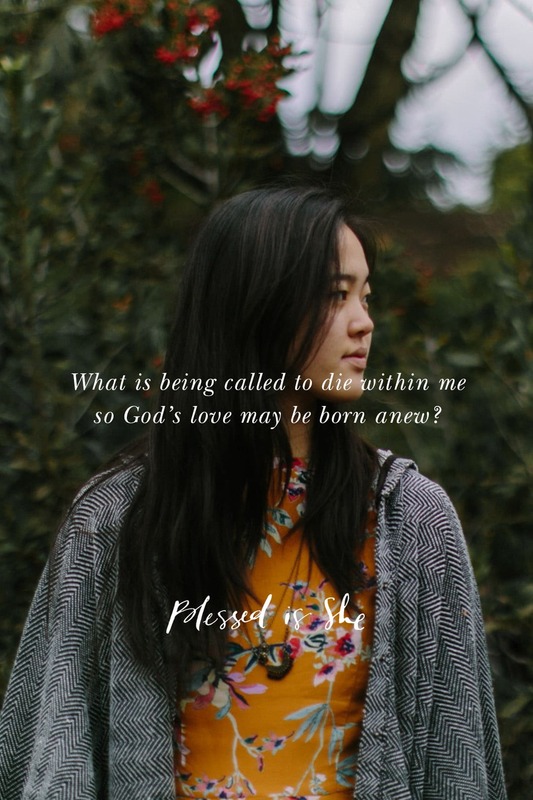 What is being called to die within me this Advent season so that God’s love may be born anew? The tension of Advent grips me and try as I may to ignore its call through busyness and holiday cheer, I know that this waiting is a time of dying. While we sing carols, and string lights, wrap gifts and fill our homes with traditions, beneath the surface of all that glitter and warm light is the shadow of the Cross and we who embrace it. It’s no coincidence that God chose to be born during the dying of the year. We followers of this Christ walk in those steps, holding the joy of His birth in tension with the death that is required. Our death is to sin and selfishness and indifference. As we prepare our hearts this Advent by allowing to die anything unloving within us, we do our best to be ready. Standing at the Nativity on Christmas night, beholding the perfect child made of light, we see across His lovely face the shadow of the Cross and the death required, and know that despite our striving, we will never be ready. It is He who makes ready all things. Today take stock: what crosses do you struggle with? How can you turn them over to Our Lord and journey together?